If I’m honest, I wanted to walk out of this play five minutes into it. Why? I was immediately bombarded by a tall, bald-headed man dressed like boxing fighter Connor McGregor yelling into a microphone, while carrying an iphone and wearing earplugs. This I deciphered was the main character Puntila (Tobias Manderson-Galvin). Secondly, the stage manager (Antoinette Barboutis) couldn’t ‘manage’ because she had no light to read her stage directions. Thirdly, a beautiful, Andy-Warhol-esque waif like female (Grace Lauer) was traversing the stage in white underwear and a white shirt, also with iphones and earplugs, rambling. This was Matti; Puntila’s ‘right hand man’ slash daughter, also referred to as Eva. Confusing much? Welcome to the world of Brechtian theatre, which as audience members we are forewarned about by the producer in the foyer of the super funky Kings Cross Theatre (KXT) prior to taking our seats. To set the framework: German playwright Bertolt Brecht’s mission in life was to create theatre that not only made audiences think, but used a range of devices to remind the audience that they were watching theatre and not real life; which this performance did perfectly. Missed cues, ad hoc audience participation, main actors also stage-managing music cues, and sound engineering gone awry. As soon as I succumbed to the in-your- face anarchy and sensory explosion I found myself laughing at the incredulity and bravery at how this production explored the dark themes and cruelty of capitalism and corporate greed. Puntila embodies everything about 21 st Century capitalism. He is a logger who owns numerous and varied corporations, and has ex-wives. 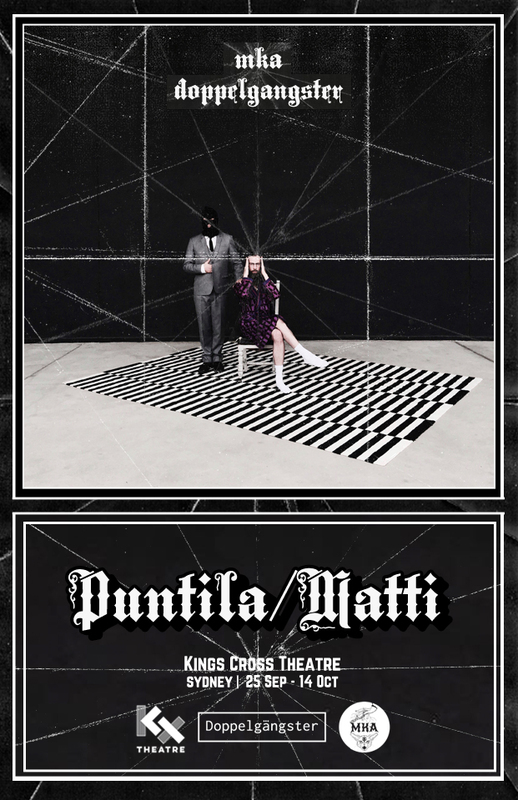 Matti is an uber driver and Puntila’s right hand ‘man’, always adhering to his barbarism. One of my favourite lines of hers delivered blankly was: ‘I liked a man once but it wouldn’t work out. Not because of race, but because I’m a classist and he was poor’. Without giving more away, lines like this throughout the messy, adhoc fast-paced production had me intrigued, and at times in hysterics, not to mention the variety of explicit, bizarre costume changes. Produced by theatre mavericks Melbourne’s MKA, and Dopplegangster: leaders in iconoclastic, political performance, it billsitself literally as a hashtag: #anti-epic #anti-comedy #anti-theatre. If you’re wanting a different theatrical experience that defines itself, as Co-Director Dr Tom Payne terms, moving on from ‘post-dramatic theatre’ and ‘contemporary performance’ to ‘post-(contemporary dramatic performance)’, brackets included, this most definitely is it. I found myself processing the play for two days after: a very good sign of successful independent theatre.